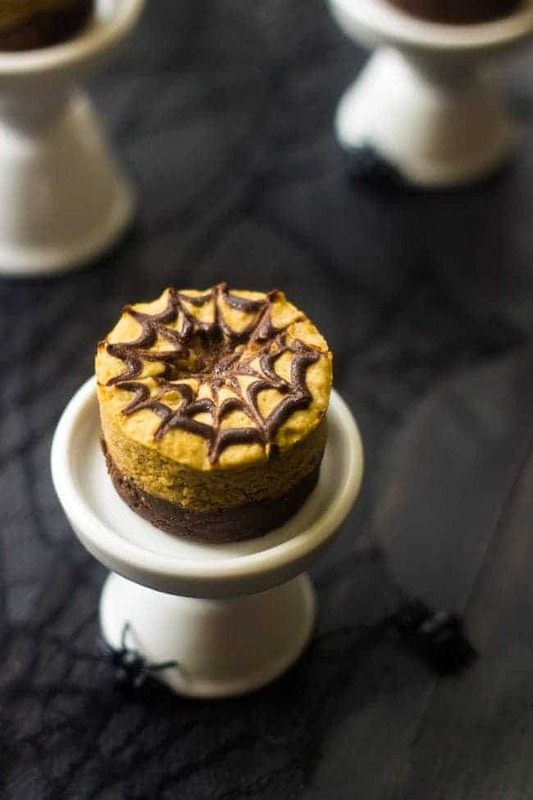 This Pumpkin Mini Cheesecake Recipe is combined with gluten free brownies and only 130 calories! 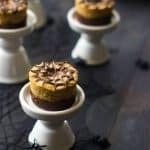 They’re quick, easy and perfect for Halloween! How was your weekend? Mine was ALL THE BUSY! My parental units came down from Canada, and are staying for a week! They were planning to come visit us in Florida this week….buuuut then we did that moving thing. So, now I have to tell you how exciting and fun this week is going to be…because my mom reads my blog. 🙂 But, seriously, it will be GOOD TIMES because my family is saweet. Because, It’s been a whole TWO WEEKS, since we last ate ALL the peanut butter ghost cookies cups and spooky mini banana cupcakes, and made both our eyeballs and tummies happy with face stuff-age of adorable, Halloween themed treats. Ok. I lied. It’s only been one. 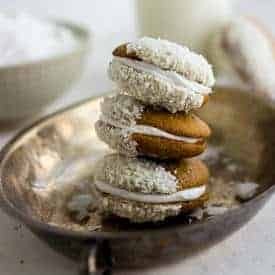 We ate Halloween skillet cookies AND paleo witch finger cookies last week. But, they weren’t cute so it doesn’t count. And, don’t worry, we aren’t singing any Frenchy songs today either. There’s healthy pumpkin cheesecake in the house ya’ll. And a mini cheesecake recipe that is only 130 calories. There is only time for MUNCHIN’. You might remember these Avocado brownies from that time that I had to apologize for not telling you that I was moving to Seattle and I shoved paleo brownies into your eyeballs (in the good kind of brownie-into-eyeballs way, not the ouchie-brownies-shouldn’t-go-there-kind-of-way) and begged for forgiveness. And, then you all LURVED them…so, I made them again. Except, you know, added cheesecake. AND because I can’t let any holiday whizz by without making no cheesecake. You know disssss by nowz. OH OH OH! Good news –> There’s pumpkin too. You like it. I like it. And EVEN my dog likes it too. That may be neither here nor there, but I wanted to give this mini cheesecake recipe some extra cred’ and BROWNIE POINTS. Get it? I crack myself up. Despite looking super show-stoppingly fabulous with their chocolate, web-covered yummosity, these are A CINCH to make. Like snap, crackle , POP, done and in yo’ face. I could tell you what inspired me to make something covered in webs. But, then you might be all grossed out and not in a stuff-all-the-cheesecakes-into-your-facial-hole kind of mood. Hint: It had something to do with forgetting to put some baked goods in the fridge, and then storing them in a Tupperware container, at room temperate for a few weeks. I opened the lid…and was inspired. Did it work? Is there more cheesecake for me? 6 oz Reduced-fat Cream Cheese 3/4 cup, not fat-free! 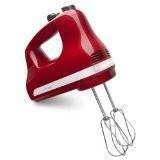 Spray amini cheesecake pan with cooking spray and preheat your oven to 350 degrees. 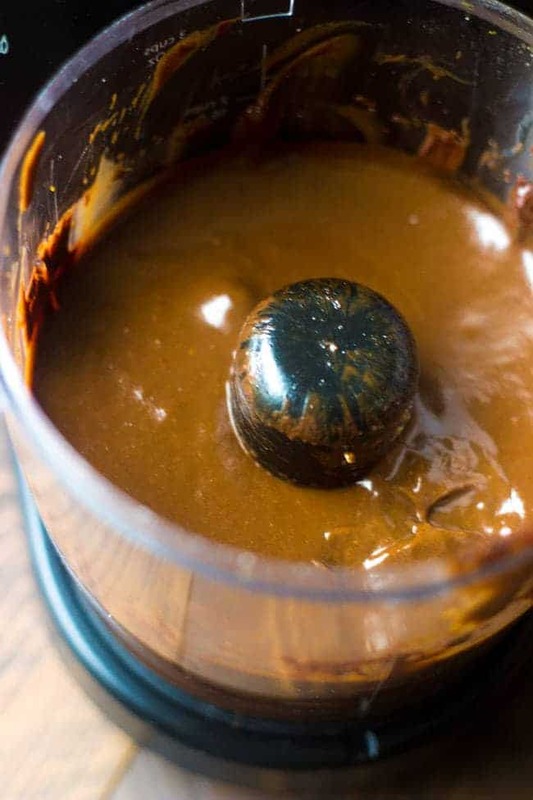 In a large, microwave safe bowl, melt 4 oz of the chocolate using 20 second intervals on half power, stirring between each interval until the chocolate is smooth and melted. Pour the chocolate, mashed avocado, honey, vanilla, egg and pinch of salt into a small food processorand blend until smooth. Set aside. 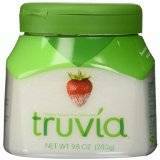 In a large bowl, beat together the Truvia and cream cheese with an electric hand mixer, until light and fluffy. Add in the canned pumpkin puree, pumpkin pie spice and egg white. Beat until just well combined, being careful not to over beat. Place the 2 oz of remaining chocolate and the coconut oil into a microwave safe bowl, and melt using the same process as above. Once melted, pour into a small squeeze bottle and drizzle over each cheesecake in a spiral pattern. Using a tooth pick and starting in the center, drag lines through the chocolate spiral, and all the way around it to form a web design. 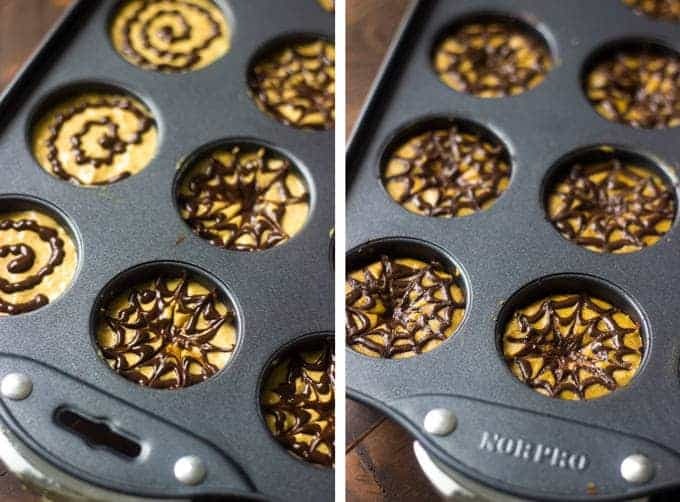 You will not use all of the chocolate, but it makes it a lot easier to do the spiral if you have a little extra to work with. * The cheesecake may rise quite a bit, but they will fall once they are out of the oven. ***I have also tested this recipe in muffins tins, lined with cupcake liners, for those of you that don’t have a special pan. You will only get about 10 cheesecakes, and they will need to be baked around 20-22 minutes, as they are bigger. Additionally, the cupcake liner will ensure that you can get them out of the tin easily. No way…there is avocado in the brownie section? Genius! They almost look too nice to eat. Just kidding, not eating them would be preposterous. YEP! I promise you can’t taste it though…that would nothing short of gnarly. Yes. Not eating would be a poor life choice. I am glad you aren’t making it 😉 Thanks Arman! I am fairy certain that if I tried to make a spider web out of chocolate, mine would not turn out very spider web-y…. nevertheless, these look amazinggggg–pumpkin cheesecake=always a good idea. You can DO IT Erin! I promise, it’s like the easiest thing EVER. I love cheesecake! These would be perfect for Thanksgiving! Avocado? Genius, and oh so cute! I hope you have a great time with your parents, Taylor! 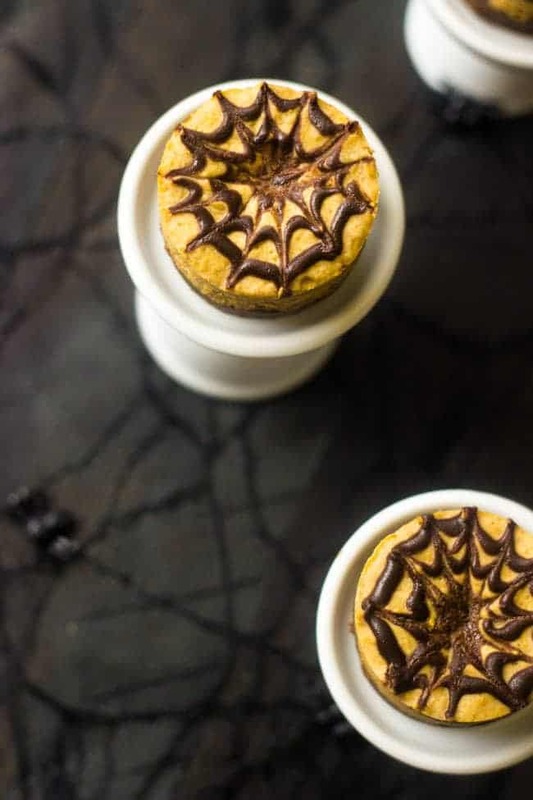 And these are seriously the cutest mini spider web-y pumpkin cheesecakes ever, Taylor! 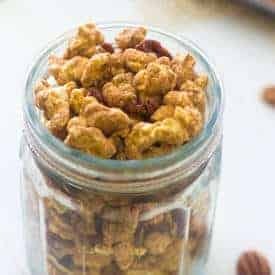 Such a fun treat, and I’m sure they taste amazing, too! Thanks Gayle! I am sure it will be a blast! Have a great Monday! 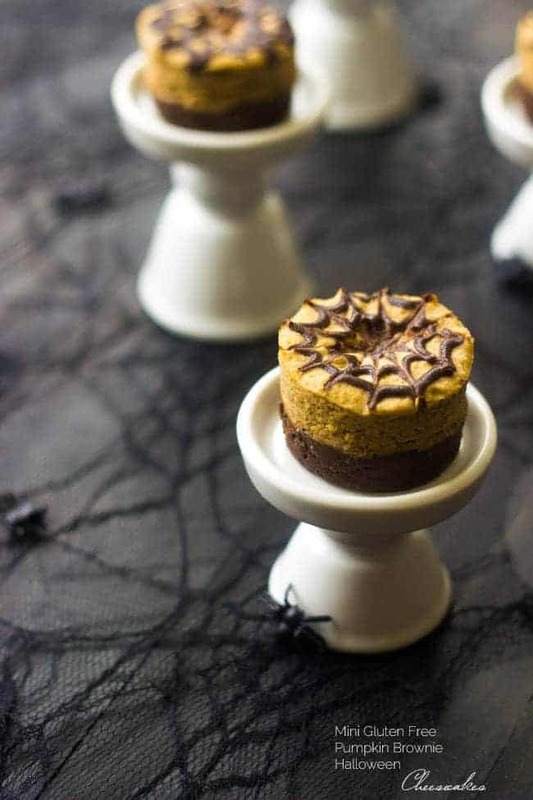 I’m all about cute halloween themed food, pinning! Why thank you lovely lady! Cheesecake is one of my all time favorite things and the first thing I learned to bake as a kid. I especially love pumpkin cheesecake and the fact that they are mini and can eat multiple ones in a sitting and not feel bad at all. 🙂 Definitely going to try these soon (after I get back from Florida next week, ha!)! MINE TOO! It’s SO GOOD! Haha! Well have fun in my old town, Florida! Then…EAT ALL THE CHEESECAKE 😉 Thanks Katharine! I literally just got back from a visit to Arkansas where the spiders were like the 1/2 the size of my hand so yeaaa spiders are kinda on my mind now too. LOL. Seriously though, I literally think I could eat ALL of these adorb things—pumpkin cheescake is my FAV and I’m dying over how cute that “web of chocolate” is! Pinned! 1/2 the size of your HAND?! GAH! Worst. These are amazing! Love the decorative tops! Too cute to eat?? Ha ha….just kidding. Of course I’m going to eat them ALL! Haha NEVER to cute to eat!! All is where it’s AT! Thanks girl! ahhhh these are so cute, I love it! the spider webs are amazing! These mini cheesecakes are totally adorable! And I LOVE the brownie bottom! I LOVE LOVE LOVE your spider webs! So so cute! I do love baking with chocolate and avocado – so I know I could gobble up that brownie layer in seconds! Sounds like we both have pumpkin and chocolate on the brain today 🙂 Hope your time with your folks is fantastic, lady! P.S. I am so curious – did you take these pictures with that light you posted on Instgram? I love how different this halloween mood lighting seems to be!!! P.S.S. Your site still eats my comments 🙁 waaah! I am JUST heading over to see your pumpkin and chocolate goodness! Yes parental units are the best! 🙂 Thanks for the lovage girlfriend! Mmm, brownies with pumpkin cheesecake?! That sounds pretty much like the perfect dessert! Oh how fun that your fam is visiting! Bet you have all sorts of fun things planned…like stuffing your face with cheesecake!!!!!!! I would if I were you…. Obvs. Is there any other way to celebrate? 😉 Ha! Thanks lady! Yes they are! It’s nice to be able to see them in realz lyfe..not on Skype! Don’t you love ebay for cute little Halloween decor? 😉 Thanks so much Amy! Godddddd, this looks unreal! Cheesecake is my absolute favorite. Must try this recipe. Thanks for sharing!! Cheesecake is my favorite too, any way any day! Thanks Matty, I hope that you love them! It is soooo awesome being able to see you, and of course we will have fun, because we are very very fun people!! <3 And BTW these are absolutely adorable, my two fave things…chocolate and pumpkin YUMMMM!! I am all about mini desserts at this time of year, lest I become a ‘maxi’! I loved the description of these little gems but then to read the recipes; avocado? Clever girl. I have to think beyond guacamole. So impressed. Haha! I had to laugh at maxi. You haven’t tried baking with avocados? It ROCKS! Thanks Toni! 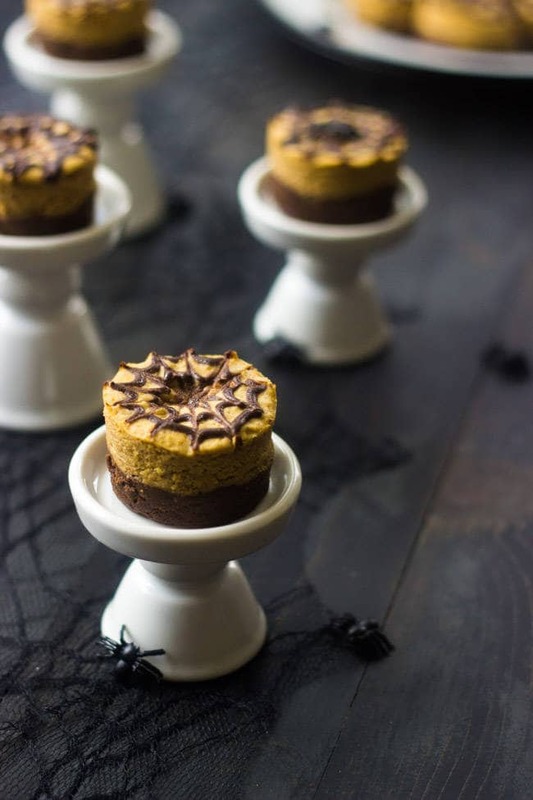 These are the cutest little Halloween desserts!! There must be webs in the air 😉 Thanks pretty lady! I heart you. 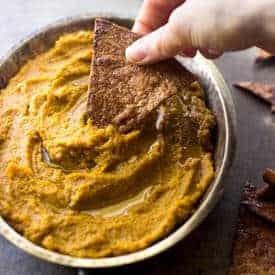 You put all my favs like avocado and health together with pumpkin. Sooo good! Pinned. I made them just for you 🙂 Thanks friend! I love this Taylor! You are getting me pumped for Halloween! I LOVE Halloween, so mission accomplished! Thanks friend! These are gorgeous, such a great combination! Enjoy your time with your parents! LOVE these little mini cheesecakes. Eat, no need to feel guilty…unless you eat more than one. And I would totally be tempted to do that! Hey at 130 calories, you can eat 2 😉 Thanks Julie! I’m in loooove with these presh little cheesecakes!! 😉 The spider web on top is the perfect spooky little detail! These look delicious, Taylor! Love the brownie bottom! Such a great idea! Pinned! oh my goodness these are too cute! can’t believe that they are only 130 calories per serving! 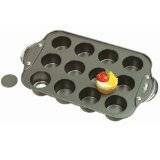 Since I don’t have mini cheesecake pans, would this recipe work OK in a 9″ springform pan? If so, how long should be the baking time using the larger pan? Unfortunately, I really can’t tell you, as the recipe was developed and tested with the mini cheesecake pans, not a springform pan. I’m sure it would be fine, but I cant speak for the baking time. I also think it MIGHT be a pretty thin cheesecake if you use the large pan. I hope that helps! Please let me know if you try it!